Decipher a Physician’s Medical Decision Making. When auditing critical care, there’s a lot to think about. You have to search for keywords that tell you whether or not the physician accurately coded critical care or not. Remember, just because a patient has a potentially life-threatening illness doesn’t mean that every visit can be billed as critical care. 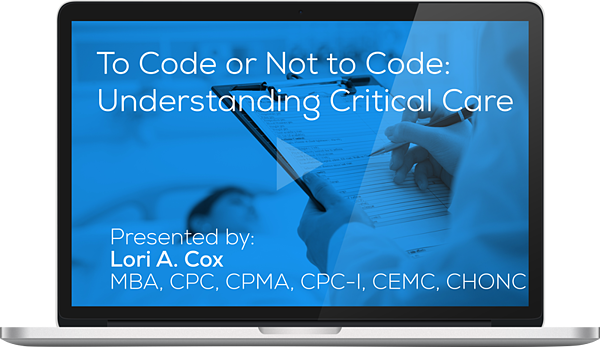 Coding critical care requires the physician to provide a life-saving measure during the visit, it requires complex Medical Decision Making, and an accurate documentation of time. PLEASE NOTE: This program meets AAPC guidelines for 1.0 CEU. Can be split between Core A, CDEO, CEDC, CEMC, CPCO and CPMA. You will receive your CEU in a separate email after watching the presentation. On-Demand viewing requires successful completion of the post-test for continuing education units.